I decided to celebrate this occasion with some Bulgogi Japchae (Stir-Fried Sweet Potato Noodles with Bulgogi). Japchae is usually served at birthday celebrations. It’s a birthday of sorts. So it was perfect for the occasion. 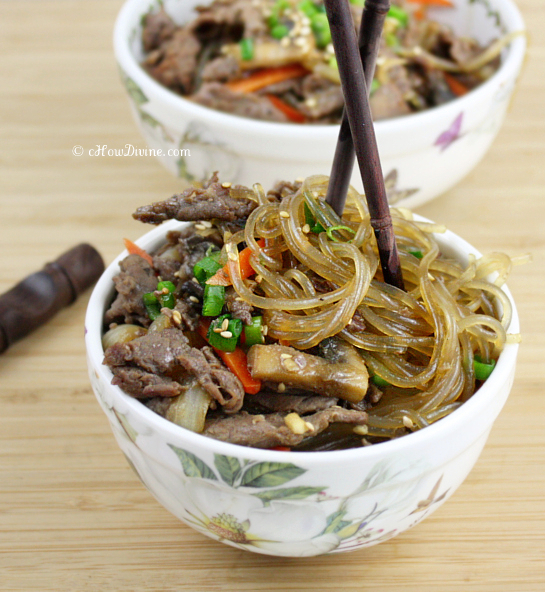 This version of japchae is incredibly easy and quick compared to the traditional version. And it’s adaptable depending on the veggies you have in the fridge. I know how much I hate wasting food. It’s nice to have a dish you can cook, while cleaning out your fridge at the same time. Use what you have. I used carrots and mushrooms, because that’s all I had. You can use colorful bell peppers, Shiitake or enoki mushrooms, spinach… whatever vegetable you want to use up. Just make sure you don’t use too much. Too much will dilute the flavor of the dish. If you decide to use more than what’s recommended in the recipe, increase the marinade/sauce accordingly. Additionally, if you don’t have dangmyeon (sweet potato noodles) readily available in your area, try Thai rice noodles. Both – dangmyeon (sweet potato noodles) and Thai rice noodles – are theoretically gluten-free; but if you have celiac disease, make sure that it is certified gluten-free. It’s truly a delicious dish. There’s a reason why it’s one of the most popular items on the menu at Korean restaurants. Stir together all of the ingredients for the marinade. Reserve about 1 tablespoon of the marinade. Add rest of the marinade to the sliced beef and onions. Mix well to ensure that all of the beef is well coated in the marinade. Set it aside and allow it to marinate. Transfer sweet potato noodles to a bowl of hot water*. Let it sit for about 15 minutes. While the noodles are softening, prep the vegetables. Heat a pan or a wok over medium-high heat. Add canola oil to coat the pan. Once the pan is heated, add the vegetables – clove of minced garlic, mushrooms, and carrots – to the pan. Stir-fry for about a minute or two until the mushrooms start to turn golden; then add the marinated bulgogi (marinade and all) to the pan. Stir fry until the meat is just cooked through (~3 minutes). Drain the noodles from the water. Add the noodles and the reserved tablespoon of the marinade to the pan, and mix well*. Stir fry until the noodles are heated through. Remove from heat. Add salt to taste, IF necessary. Garnish with some chopped green onions and toasted sesame seed if desired. Serve warm as is or serve over steamed rice. For the hot water I use for the noodles, I always heat cold water in a stainless steel pan I am using to prepare the dish. The reason is two-fold. (1) Less dirty dishes/pans the better. But more importantly, (2) Hot water from the tap can contain hazardous metals – in particular lead – from the pipes (especially if the pipes are old). Don’t worry, the lead is not from the water source itself. It’s usually from old pipes that are corroding, and hot water makes it much easier (so more likely) to leach water from the pipes. You can also stir fry the noodles separately. This will give you a stir-fried or slightly oilier texture – what you’d get at restaurants. Additionally, if you are using sugar, add a tablespoon of water or broth to the marinade. For a vegan or vegetarian version, try Vegetable Japchae. 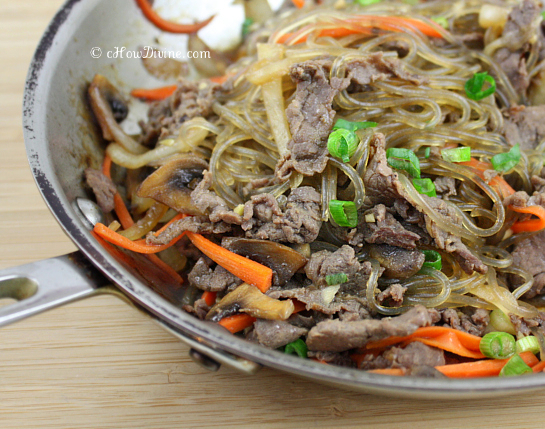 Ok, seriously your Bulgogi Japchae looks amazing, and yes perfect for the celebration. I just want to grab that bowl and eat it now! Awesome recipe and vibrant, exquisite and delicious pictures. Thanks Sandra for your kind word! It’s so encouraging. 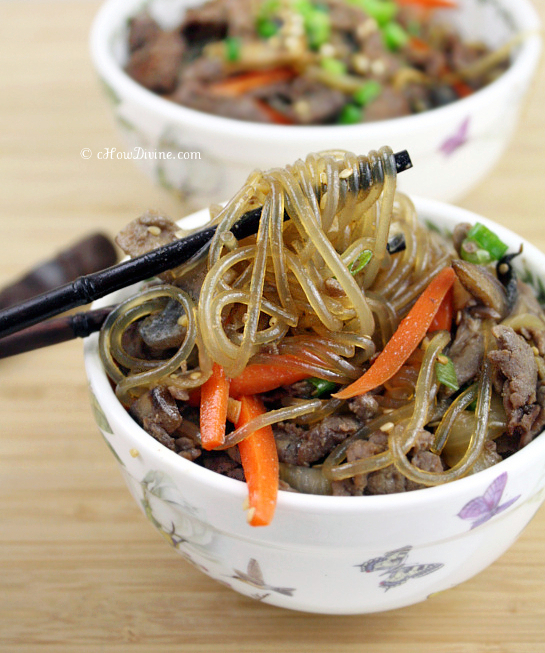 I wish I can share some Japchae with you, especially since I make SO much of everything! 🙂 Hope you are having a wonderful week! Look at those noodles! This is so delicious. I am pinning it so that I don’t forget it to make it sometime for myself. Thank you Julia! It’s one of our favorite noodle dishes. I hope you try it out. Hope you’re having a lovely weekend! So glad you joined up on FB! Just be sure to go in and set your privacy settings to what you want, not what FB wants. If you don’t know how to do that, let me know and I’ll help you. What a great dish to celebrate with. Love those noodles and the sauce and vegetables make this a great meal! Thank you so much MJ! FB is not as intuitive as I thought it would be. I just may have to ask you for help if I can’t get it together soon. 🙂 Thanks again! Noodles are thought to be food for a longer life. It is a belief of the Chinese people because of the noodles’ length which represents long life. This is the main reason why it is served mostly during birthday celebrations. Here is my confession: i order japchae every single time when I eat in a Korean restaurant. There is something in there that is so irresistible. This recipe looks excellent! I like it a little spicy so I normally also add some chili power. Thanks for sharing! I love japchae! Yours make me drool while reading this post. 🙂 I’ve tried different recipes every time I cook. I’m going to try yours next!